This is a time to pause our own busy lives to remember all those who have given their lives for our freedom. People across the nation will pause to reflect on the sacrifices made by the brave service men and women who have fought for our country, selflessly and courageously. Remembrance Sunday 2018 - Sunday 11 November 2018 - As part of the Remembrance Sunday commemorations, Britain and Germany are joining in a call for bells of all kinds to be rung globally to replicate the outpouring of relief when the guns fell silent. Danny Boyle's beach takeover ‘Pages of the Sea’ to honour World War One soldiers. 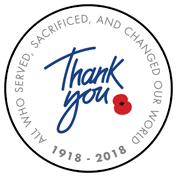 The Royal British Legion has been running a mass movement to say ‘Thank You’ to all who served, sacrificed, and changed our world during the First World War. The charity is calling on mass involvement from the public to mark the centenary of the end of the First World War. Forces Reunited's sister website Forces War Records is honoured to join with The Royal British Legion to say Thank You in the Centenary year. 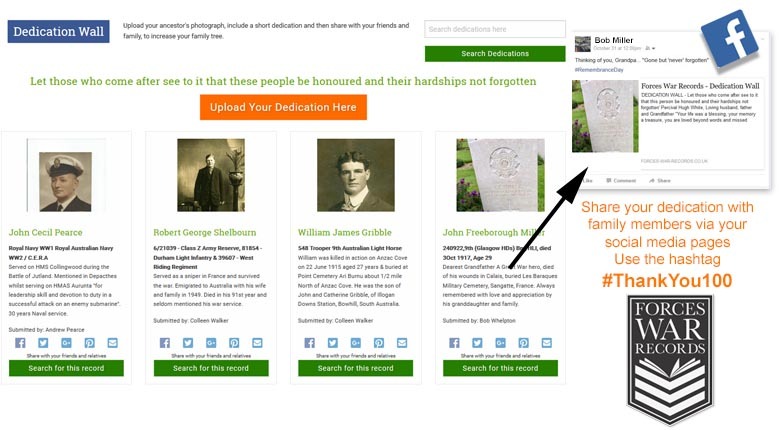 You can get involved by posting an image of your WWI ancestor’s, including a short dedication on the Forces War Records ‘Dedication Wall’. So, if you've not yet used the Forces War Records Dedication Wall to post a lasting memory of your loved ones, what better day could there be than today.